Custom rhinestone pins and rhinestone jewelry made to order by Rhumba! for your business, organization, event or charity. We can make quality custom rhinestone jewelry to your specifications. 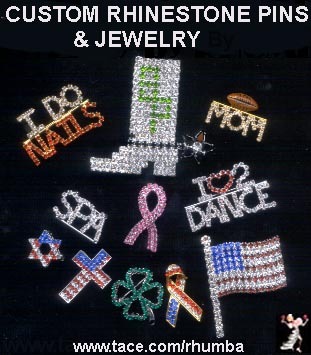 Choose your logo, company name, awareness ribbon or theme motif in quality crystal rhinestones. Write a slogan, choose an existing piece in your personal colors or design your own jewelry. We can do cast or chain link pieces. Our minimum is only 60 pieces with turnaround time from six to eight weeks from design approval. Custom packaging also available. Reasonable pricing, dependable service and quality jewelry have our customers returning year after year. Call us at 773-929-9007, Fax us at 773-525-1920 or email us and let us know what you have in mind.